The Aqua Tech Monopod Wrap was designed to make carrying your monopod easy without inflicting discomfort to your shoulder. The outer fabric is made of a Polyamide material which has exceptionally high abrasion resistance and a soft feel. It also aerates when in contact with skin and will not hold water or perspiration which could lead to rashes or blisters. The inside surface is a rubber-like, high-quality neoprene 12mm closed-cell foam which is durable and provides superior adhesion to the monopod leg. You will notice before applying the Wrap that it is shaped a little like your hand. The inside gripping surface is smaller than the outer surface so it naturally wraps around the pole. The fingers in this case are the three large hook-and-loop tabs that adhere to anywhere on the outer fabric, so it can be secured tightly. The combination of the inside rubberized grip surface and the adjustable hook-and-loop tabs will ensure that the Wrap will not cause irritation to the user by sliding down the pole. Box Dimensions (LxWxH) 10.7 x 4.3 x 2.4"
Monopod Wrap is rated 4.6 out of 5 by 19. Rated 5 out of 5 by Anonymous from Great Padding Great addition to my Benro A48F monopod especially when I'm carrying the Sigma 120-300mm 2.8. The only thing that may bother some people is that once you add this to a large diameter monopod then it makes gripping it a little harder if you have small hands. I also will be using this on my carbon fiber Manfrotto 055CXPRO3, since it does not come with any pads. It does however make it a little harder to close it completely but that has not been a real issue. It should also help on cold days. Really glad I purchased this. Rated 5 out of 5 by pm-r from This is the BEST monopod pad EVER! There are two Lightware monopod pads in the trash can in my garage right now. A buddy of mine turned me on to these and they completely replace any need for competition out there for this type product. I've had Canon pads, Lightware, and even a few home-made jobs too. I hump a 600mm f/4 and 400 f/2.8 at football games and I'm 45 yrs. old. These pads really make a difference at the end of the day! They are super comfortable even at a dead run, bouncing on your shoulder, and they fit perfectly, due to the three heavy duty velcro straps. None of my prior pads ever fit right on a monopod with the rubber grip at the top--not this one!!! This is an Awesome product that will do very well for you! Rated 4 out of 5 by TravisB from Great Wrap! So much better than the Canon foamish piece. Let me put it this way, its like going from a worn out matress with springs poing through, to a memory foam piece of heaven. My first assignment with this was the Indy 500 last May, and it was a LIFESAVER. That is a huge track, and I was slogging the 400 2.8 IS all over the place. Without that pad, my shoulder would have been a wreck. The only reason I gave it 4 stars instead of 5 is that if you have rain gear with any kind of velcro, it will get caught on the pad, which can be annoying. Other than that solid. Rated 5 out of 5 by Snaper from Glad I purchased this one!!! I have a mono pod from Manfrotto and was looking for extra padding of some type. 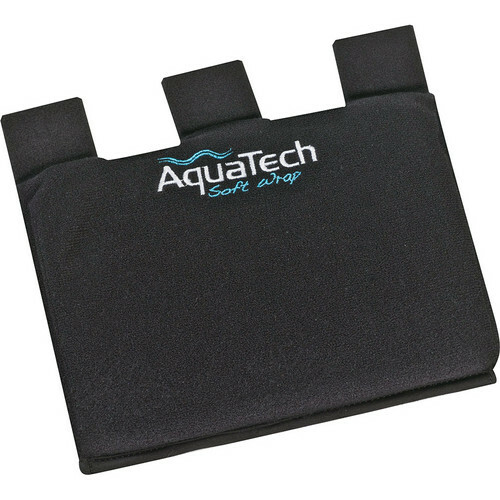 Decided to look on B&H's site where the AquaTech was listed, so I purchased one to see how it was made. It arrived today, and I really like that it locks itself in place and doesn't worm around the shaft of the mono pod. I may wind up adding some more bulk under the pad, but as is it's plenty to tote around a 300mm 2.8 lens. Rated 4 out of 5 by Revup67 from A bit thin, but does the trick Tripod or Monopod wrap. The velco and construction are excellent just the padding is a bit thin. Though it is added support for sure, we went to a fabrice store and bought additional header to stuff around the monopod / tripod legs using the Aquatech product to hold it all in place. No slippage, works much better as there's no grinding of the carbon fiber legs in your shoulder blades. This is the second one we've purchased as one is not enough for a tripod. Rated 5 out of 5 by Joseph from Worth every penny I bought this after getting tired of having a sore collar bone from lugging my gear up and down the sidelines at football games. The padding on my monopod is great for a grip, but is not very soft. I used it for the first time shooting a football game last week, and it made a world of difference. I wish I would have bought it a long time ago. The only disadvantage it has is that it is difficult to remove. Rated 5 out of 5 by John from One of the best purchases I have made! With the recent purchase of a Canon big glass lens and a new monopod, it was out on the trails for this kid. It didn't take long for the monopod and lens (carting it hobo bag & stick style) to start killing my shoulder. This pad wrapped neatly and efficiently to my monopod with three not one tabs. Very well desighned and constructed of heave duty material...this pad will probably outlast my time on earth!